The power of IBM® MQ is its flexibility combined with reliability, scalability, and security. This flexibility provides a large number of design and implementation choices. Making informed decisions from this range of choices can simplify the development of applications and the administration of an MQ messaging infrastructure. Applications that access such an infrastructure can be developed using a wide range of programming paradigms and languages. These applications can run within a substantial array of software and hardware environments. Customers can use IBM MQ to integrate and extend the capabilities of existing and varied infrastructures in the information technology (IT) system of a business. IBM MQ V8.0 was released in June 2014. Before that release, the product name was IBM WebSphere® MQ. 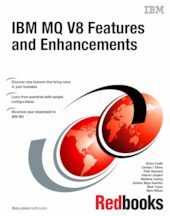 This IBM Redbooks® publication covers the core enhancements made in IBM MQ V8 and the concepts that must be understood. A broad understanding of the product features is key to making informed design and implementation choices for both the infrastructure and the applications that access it. Details of new areas of function for IBM MQ are introduced throughout this book, such as the changes to security, publish/subscribe clusters, and IBM System z exploitation. This book is for individuals and organizations who make informed decisions about design and applications before implementing an IBM MQ infrastructure or begin development of an IBM MQ application.